In an webinar discussion, as part of the IDEC@Internet digital symposium, Drs. 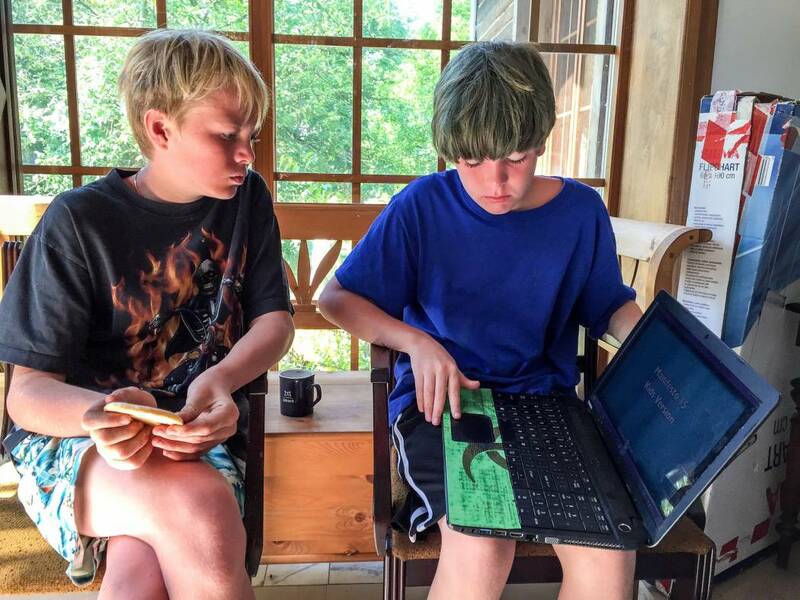 Kelly Killorn-Moravec and John Moravec discussed their findings from World Café conversations at the European Democratic Education Community (EUDEC) annual meeting in Warsaw in August, 2015. In these conversations, they invited the EUDEC community to provide feedback and insight on how to best actualize the principles enshrined in Manifesto 15. The following notes present a summary of our conversations, together with actionable “next steps” that will be worked on by the Manifesto 15 community and shared further at the IDEC@EUDEC conference in June, 2016. Question 1: What good examples or good practices already exist? Participants in this discussion identified many practices that currently exist which fit within with framework of the Manifesto 15 principles. In regard to educators, these include growing the number of teachers who are questioning and seeking answers for change, sharing good ideas with one another, and living the principles of Manifesto 15. Current good practices specific to learners include engaging students emotionally, socially, and mentally by creating a physical space conducive for learning and developing within it an environment of respect and transparency through providing opportunities for moving from child-centered toward child-emergent learning, allowing for personal choice in learning, connecting to students’ previous experiences and interests, and participating in projects involving collaboration and teamwork. Specific examples included free-schooling methods, “flipped” classroom instruction, students as teachers where the teacher is a partner or mentor, mixed-age groups, developing a school government system, providing opportunities for social entrepreneurships during which students learn through engaging with the community, student education retreats, student-developed startup weekends funded through foundation resources, Social Impact Awards, and the development of learning communities where participants are both teachers and learners simultaneously and on equal terms and are engaged through mixed disciplines and subjects, linked to society’s needs. Resources for development currently being used included Ted Talk videos and discussion, MOOCs, networking and collaborating through EDUFORUM, and systemic modeling of teaching and learning methodologies. Question 2: Where do you want to go in the future? Ideas for a future vision of education were also considered. These centered on the concepts of learning environment and relationship building. Within the topic of learning environment, participants suggested ideas such as changing the model to allow for more “knowmadic” experiences, removing compulsion from schooling, providing free opportunities for education and learning, classes with mixed-age groups, differentiated settings for learning, small class sizes to encourage student cooperation and collaboration, development of centers for projects on different topics, student choice in course offerings and learning opportunities, developing one’s own sense of learning, students leading teaching with teachers serving as advisors or mentors, development of soft skills, providing a space for failure and supporting students in their attempts to try and fail, developing a safe space for communication, and cultivating an environment of trust where intercultural respect exists and everyone is tolerant of one another. Similarly, participants identified the importance and advantage of integrating “micro worlds” through developing relationships between students, parents, schools, and communities. Through this interconnected community, experiences can be shared and ideas may be communicated; global and transnational learning communities can be developed; and established resources (universities, communities, libraries, texts, etc.) may be connected and shared with interested learners. Finally, needs were identified to further develop teacher preparation coursework to support these ideas and the principles of Manifesto 15, while deliberately incorporating technology in non-invasive, “invisible” ways. Question 3: What are our next steps to make this happen and what can we share with future Manifesto 15 groups? As participants discussed what they envisioned for the future, several next steps emerged. First, developing opportunities to promote, explain, discuss, and further clarify the principles of Manifesto 15 through development of a glossary of terms, translation into new languages, synthesis of new ideas, and authentic redistribution through such means as social media presence, stickers, bumper stickers, magnets, notebooks, calendars, t-shirts, and short video clips highlighting each principle. 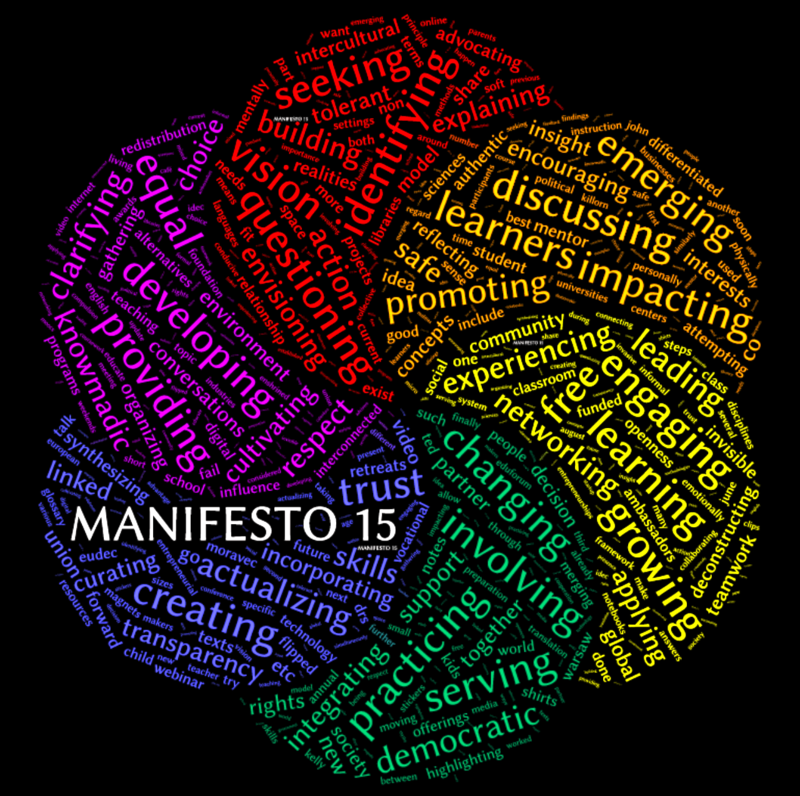 Further, curating the principles of Manifesto 15 within communities and online could be done through a group of “Manifesto 15 Ambassadors” who would share and promote ideas, co-educate one another, and involve kids (we are already moving forward with this idea and will have an update soon). Second, participants suggested identifying more good practices for application, such as deconstructing the myths in education and sharing the realities of schools; being examples of openness and trust; sharing the experiences of what has been done, what is wanted, and what is needed; using every opportunity to learn; and taking time for reflection and summary. Third, the importance of creating communities through a shared trust was also discussed. This might be done by connecting with – and involving – schools, businesses, communities, and industries through shared communication, education, and decision-making; organizing and gathering people to produce impactful collective action; and engaging teachers within various contents (English, vocational, humanities, social sciences, etc.) in discussion around the principles of Manifesto 15. Finally, it was suggested that we might involve political groups and influence decision-makers to create alternatives to what currently exists. Examples of this include taking steps to change teacher education programs, merging formal and informal education, and developing opportunities for entrepreneurial skills development, and creating a union to advocate for children’s rights.